benefits of controlled release nutrition. Complete pant nutrition: Controlled release micronutrients can be added to Multicote™ formulae, to provide complete, balanced nutrition throughout the growth cycle. 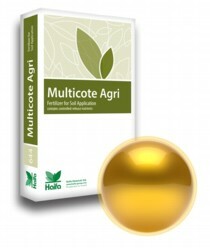 High efficiency: Multicote™ fertilizers release plant available nutrients at a rate that matches crop's needs. Thus, the nutrients are consumed efficiently, with near zero losses to the evvironment. Optimal plant development: Each plant receives an accurate supply of nutrients at a rate that matches crop's need's. Thus, the nutrients are consumed efficiently, with near zero losses to the environment. Saves labor and time: A single application of Multicote™ formula covers the crop's requirements throughout its entire growth cycle.